I like reading books, holding them in my hands and putting them on the shelf after reading them. Books on paper are familiar and when ordered over the net they arrive in the mail just a few days later. Why change something that works? 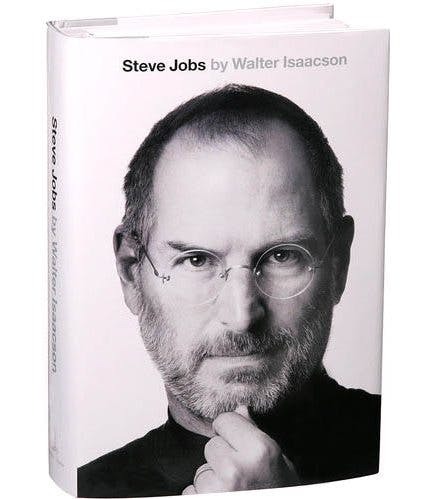 But Steve Jobs official biography is a book I wanted as soon as possible. It’s a story about an earlier revolution that changed the world, and the man in the center of that revolution. Without a doubt there are similarities to what’s happening today, and lessons we can learn from them. Since I’ve read the authors biographies over Benjamin Franklin and Albert Einstein (two other fascinating men) I knew I’d love this one. I pre-ordered the e-book from Apple’s iBookstore. It’s my first e-book (I’m a bit late). When the book was released yesterday it automatically appeared in my iPad. It’s a fitting way to read it. And not surprisingly it feels like the future. Again. Although Steve Job's death was certainly tragic, I'd like to give a little tribute to Dennis Ritchie, the creator of the C programming language, and key developer for UNIX. He died without much fanfare, but his impact on our daily lives was as great, if not greater than the impact of Steve Jobs. RIP. Excellent observations,doc! I, too, am late to the e-book party. I tried my sister's Kindle and it felt strange. I realize I'm fighting a growing tide and will one day have no choice. You picked a great story for your initiation. Although not necessarily an incredible inventor, Jobs was a thinker, innovator and visionary without equal in modern times. His ideas changed the way we view communication, music and information forever. Enjoy! First I thought you 'pre-ordered' it in Swedish way: from The Piratebay. :) Book is good but nothing really new for me in the first half, but second half may be more interesting. I am not Apple fan at all but I like what it does and Steve Jobs was exceptional fellow. I am hacker type and want to customize (more than Apple would allow me to do). That's why using Linux and custom built hardware instead of fruit products. Darn, the title of this post made me think YOU had written an e-book! Sorry I won't see you in Las Vegas. Stay away from the casinos and say hi to our mutual friends. I will be interested in your impressions of the Jobs biography. I haven't got the time to read it just now but I gather it talks about his veganism and his choice to try a "special diet" for nine months before getting his tumour removed. Both issues have been relatively downplayed in the mainstream media. Consider what they would have done if he had been a LCHF adherent! Yes the story about his cancer is very sad. He had a (probably) curable cancer, found early by chance. But he refused to be operated for 9 months while it grew, against the loud protests of his family and friends. Meanwhile he tried to treat it with his usual vegan diet and some very alternative treatments. We know how it ended. When reading I also wonder about his famous temper. It seems to have been much worse than previously reported. I wonder if his bizarre eating habits (even by vegan standards) made it worse. Doc, I think we can summarize everything about Steve, his life, his vision, his temper and even his death with one word.